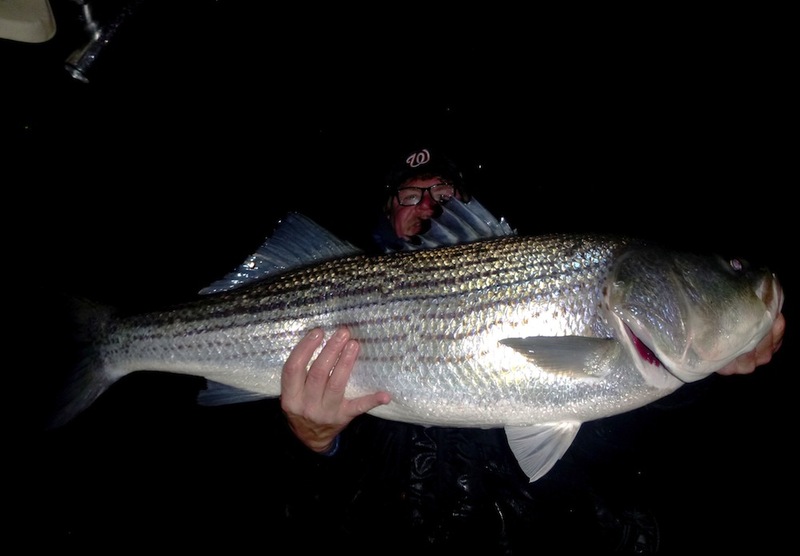 Chesapeake Bay fishermen who like to catch & release big winter stripers have two basic options. One is to fish deep holes, either in the main stem of the Bay or up in the outside bends of the rivers (watch where the gill netters are setting up), or to work the warm water discharges (WWDs). Since we’ve had a very mild winter so far, the warm water discharges have been inconsistent. Just like last year, I’ve found my best chances for catching this winter are right off Kent Island. 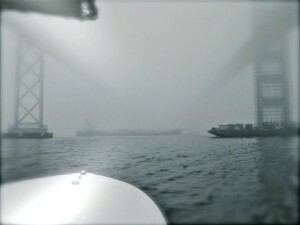 The Bay Bridge is one of the best places I know of to jig up deep water rockfish. Two- and three-year-old-stripers and white perch survive the cold winter by stacking up around the Bay Bridge rock piles. They’ll stay there until the spring freshet washes out their warm water comfort zones. Even though they are readily apparent on a fish finder, they aren’t always easy to catch. To coax a strike out of deep-water stripers, you just have to aggravate them until they bite. 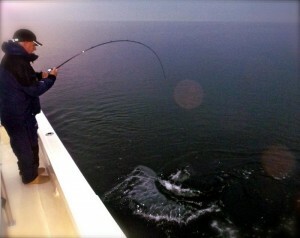 You can jig for hours and not get a single strike, then, snap – the fish will turn on and you’re catching every cast. When fish are deep and sluggish, my strategy is to throw brightly-colored jigs with a lot of contrasting colors and scents. I start with either white, light purple, or chartreuse soft-plastic jigs, then dip them in contrasting colored garlic dye. Since the current is strong at the Bay Bridge and I want to bang the bottom on every cast, I use ounce-and-a-half or two-ounce jig heads with a wide gap barbless hook. Winter Bay Bridge rockfish feed at very specific spots. 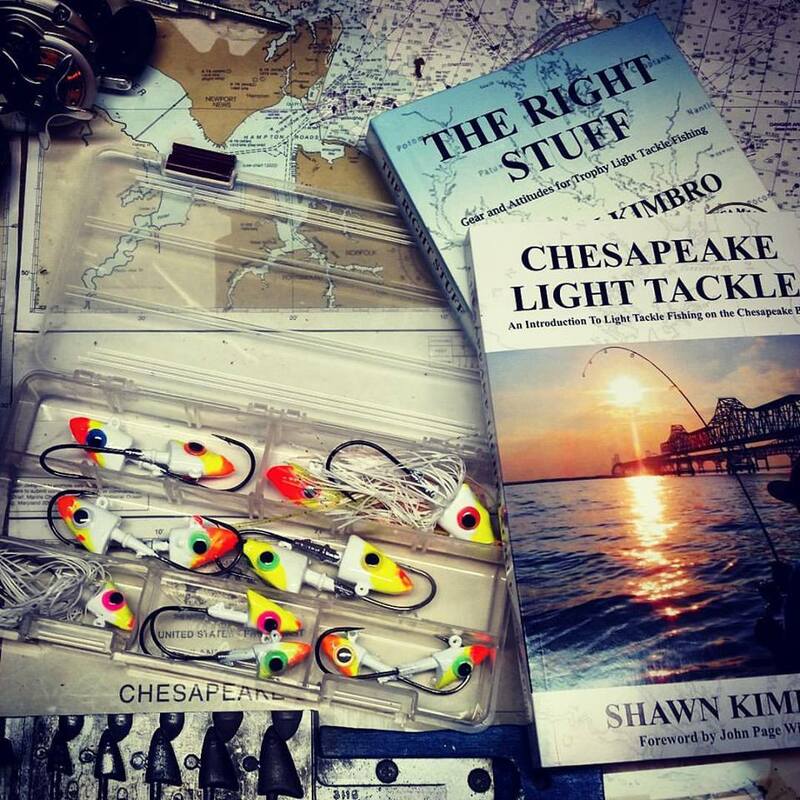 On page 228 of Chesapeake Light Tackle – The Book, I tell you exactly where. A huge bonus is that, occasionally, a huge striped bass will stop by the rock piles. When that happens, I hope you’ve tied good knots and checked your drag, because, you’ll need it! I also like to fish the warm water discharges this time of year. Within a 30-mile boat run from the Bay Bridge there are more than 30 industrial or utility sources that discharge warmer water into the Bay. 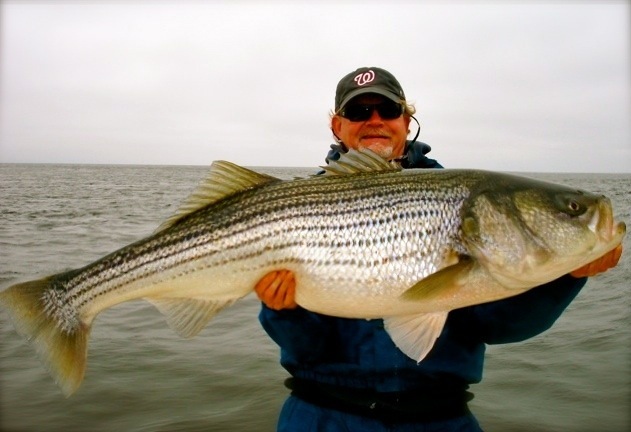 This is important, because warm water brings in the bait and the bait brings in trophy striped bass. Most of the discharges in Maryland are in the Patapsco River near Baltimore, although there are also several in the main stem of the Bay and in other tributary rivers and creeks. It’s way too early for a consistent bite at the WWDs because ambient water temperatures in the Bay are still up in 40s. You can’t count on the fish being there, so every trip is a dice-roll. It takes a dramatic temperature break to turn the rockfish on in the outflows, and surface temps are still way too warm for this to happen. Hopefully, it will be soon, but late February and March is usually the best time for the WWDs in Maryland. Nevertheless, I’m hearing reports of a few nice fish at the WWDs now and then. If you’re up for it, an exploratory trip could be worth the effort. I don’t weigh fish in the winter, and most of the fish I catch never come out of the water. Once in a while, I will hold a pretty fish up for a picture like the ones in this post. I keep the camera ready on the console to make sure the fish isn’t out of the water very long. If you’re prepared, it only takes about 15-seconds to hold up a fish and snap a picture. know would check in at over 40 pounds. My buddies and I have caught several more in the 30-40 inch range. Some have been even bigger. (Attached are some recent pics of fish caught by Jamie and Rich.) 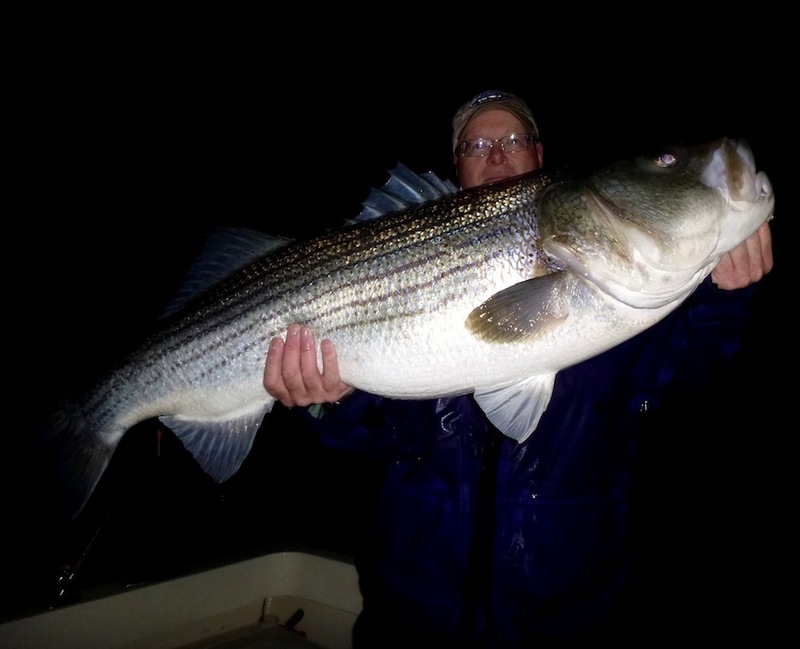 These guys are on the leading edge of light tackle Chesapeake fishing right now. The good news is, I expect fishing to get even better. Conditions are getting right to produce trophy-sized fish. We have a lot of gizzard shad in the shallows and plenty of white and yellow perch in the deep holes. A good rule: the worse the weather, the bigger the fish. My advice: Go when no one else will. Fish early. Get out before the sun. Remember: big rockfish like unsettled conditions – humans don’t. I don’t want to give anyone the wrong impression – fishing is tough in January. I’m not encouraging anyone to take risks by going out in dangerous conditions. Be safe. Cold water fishing can be deadly. But if you’re dedicated enough to get off the couch and fish, your chances are better than ever to catch your rockfish of a lifetime. 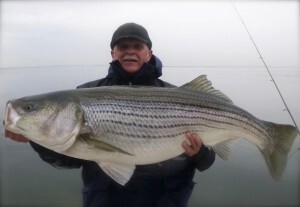 That fireplace might be comfortable on those cold-snowy-sleety-rainy-foggy-windy days, but the big stripers out there aren’t going to catch themselves. Eight days more days of duck season and then you’ll be seeing me fishing. Great read as usual, Shawn. You guys sure do know how to catch them. Catching a trophy striped bass is why I am out there fishing every chance I get. Whew. I need a cigarette. Nice fish guys. IT SEEMS LIKE EVERYTIME I WANT TO GO FISHING THE WIND BLOWS. I’M NOT AS BRAVE OR CRAZY AS YOU GUYS. THANK YOU FOR THE INFROMATION. I WANT TO TRY THE BRIDGE AREA IN THE WINTER. Ugh…I need to get out there soon! Shawn , the biggest fish that I have seen caught this year was from one of the discharges in the Inner Harbour. I couldn’t believe it. Heard you got a very nice fish today. I’m living vicariously though you guys right now. Really cool. If this read and pictures doesn’t get you motivated to get out there,don’t know what will. This is just another winter report where every fish is bigger than anything I’ve ever caught but I will get there. I’ll beat those damn fish and you too Kimbro. Take a look at my blog http://www.joytbkiptopekecows.blogspot.com and maybe laugh at my learnings as a newbee fishing for stripers in the Chesapeake. I do mostly Kerr Reservoir for stripers in the summer and cast net bait. Use a Ray Jefferson to run over striper schools and pinpoint ’em with the Lowrance HDS. Only do eels in the bay, but almost got with jigging this year. I’m a slow learner, but keep pluggin’ along and may put my jigging tackle to use very soon. Frequently read your book in the throne room and fashion a stragety for my next Cheasapeake Bay adventure. Other times, I just enjoy surfin’ your CLT posts. I try to help newbees like me skip to the head of the learning curve. I could be wrong . . .